Is this Royal Enfield Bullet going too fast, too near the edge? 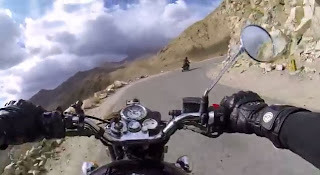 Reader Michael O'Reirdan pointed me toward the latest GoPro video featuring Royal Enfield motorcycles on the "Highest Road in the World." GoPro, maker of helmet cameras, gave us a hint of its adventure with Royal Enfield motorcycles in its original "Be A Hero" video. But this time it's all Royal Enfield Bullets, close up, at speed and right on the edge of the cliff all the way up the Himalaya Mountains. The story-behind-the-story is on the Vintage Rides blog. Vintage Rides arranged the logistics for the GoPro raid through Delhi, Jaipur and Ladakh. The video features world-girding motorcyclist Alex Chacon. Of his first time on a Royal Enfield he told Vintage Rides that "The Bullet was a great, classy looking bike with plenty of power to enjoy the on and off roads of India." Watch the video for a stomach churning bash through the traffic of India and up the rutted roads of the Himalaya. Would you treat your Bullet the way these guys do?